Streaming media players make it easy to play Internet content (videos, movies and TV shows) on your big screen television. 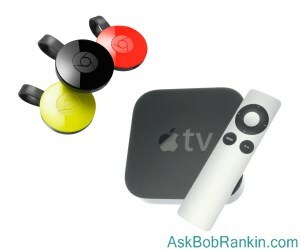 In this article, I'll compare the features of Google's Chromecast with the Apple TV. Apple TV is a "hockey puck" crammed full of electronics. It’s a small box, only 4 x 4 x 1.5 inches, but it takes up shelf space. External ports include HDMI, Ethernet, USB-C, and a proprietary power cord jack. The AC/DC power converter is inside the box, so there is no wall wart or brick to contend with. Also inside are WiFi and Bluetooth radios, and an infrared receiver for remote control. Either 32 or 64GB of storage space are available. A 64-bit A8 chip handles all the data processing. The Apple TV weighs about 15 ounces, and as Henry Ford would say, "You can have any color you want, as long as it's black." Chromecast doesn’t take up any shelf space. Its form factor is a disk 2 inches in diameter and 0.6 inches thick. A short HDMI cable emerges from the disk, allowing your Chromecast to just dangle from your TV’s HDMI port. A Micro-USB port accepts a thin power cable that connects to a wall power supply. WiFi is the only wireless connectivity; an optional Ethernet cable adapter is available for $15. The Chromecast contains the Marvell Armada 1500 Mini Plus 88DE3006 SoC, which has dual ARM Cortex-A7 processors running at 1.2 GHz. Only 512MB of RAM and 2GB of flash storage are included. The Chromecast dongle weighs less than 2 ounces and comes in three colors: red, yellow or black. The lightweight specs of Chromecast compared to Apple TV reflect the different ways in which the two products process data. Both products require an app for each streaming media service provider (i. e., Netflix, Hulu). Apple TV runs apps on itself. Chromecast relies on apps installed on external devices such as smartphones, tablets, laptop or desktop computers. With Chromecast, you'll use an app on your computer, laptop, tablet or smartphone to find a video you want to cast onto your TV screen. Once the stream starts, the Chromecast dongle takes over management of buffering and displaying the content, freeing your device for other chores and conserving a mobile device’s battery. Roku is another streaming media player that I've covered here. See my article Can Roku Replace Cable TV Service? to learn about the Roku product line. Chromecast is compatible with devices running Android, iOS, or Windows. Apple TV can stream content stored on an Android device using Apple’s AirPlay protocol and an app such as DoubleTwist. Windows is supported via iTunes for Windows. Remote control is also handled differently by each product. Chromecast relies on those external devices, while Apple TV comes with a new Siri-enabled remote control that’s getting mixed reviews. Apps used with Chromecast can provide full virtual keyboards that make typing login credentials and search terms fairly easy. The Apple remote has a 1.5-inch square touchpad; using that to navigate a straight line of alphabet characters on a big screen is very tricky; it’s easy to overshoot characters. (See apple_tv_keyboard.jpg) Fortunately, Siri’s voice control works well for searches. But login credentials for service providers cannot be entered using voice commands. Apple TV now has an app store, as does Chromecast. But all apps for Apple TV run only on iOS, and there are few apps that aren’t music or video related. Chromecast apps include games and other types of applications that might look or work better on the big screen. Most recent comments on "Apple TV vs. Chromecast"